Through the latter stages of the NASCAR Nationwide series event at Bristol Motor Speedway, the Saturday afternoon race was a triumph for the Penske Racing Dodge team. With the #22 car Brad Keselowski set the pace through 71 laps in the latter stages of the Scotts Turf Builder 300, the 2008 ARCA ReMax champion Justin Allgaier used a late restart to captured his first major NASCAR victory over teammate Keselowski. Started with mid-day pole qualifying for the afternoon's NASCAR Nationwide Series race, Penske Racing's Brad Keselowski skated his #22 Dodge around Bristol the fastest of any competitor in qualifying. Joey Logano, Kelly Bires, Carl Edwards and Greg Biffle rounded out the top-five in the timed session. Once the green flag dropped, a hectic start allowed Keselowski's front row comrade Logano to muscle by to lead the first 21 laps in his #20 Toyota. Overpowering Logano, his stampeding Joe Gibbs Racing teammate Kyle Busch took the lead on lap 22 holding the top spot for 58 laps. With eager, young talent of the NASCAR Nationwide Series fighting the position within the tight 0.533 mile short oval, Saturday's Scotts Turf Builder 300 race at Bristol Motor Speedway delivered the customary calamity. In all, the the 300 lap event was slowed on 11 occasions by yellow flags. 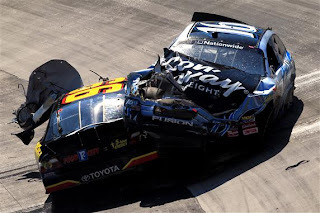 The most serious incident occurred on lap 90 started when the #7 JR Motorsports Chevrolet driven by Scott Wimmer drilled a slowing #11 Toyota of Brian Scott into turn 1. As Scott's car was sent sliding up the track, the Toyota came to a brief rest between turn 1 and 2. Unable to avoid Scott's car stationary, the #16 Colin Braun-driven Ford struck the #11 and was in turn pounded by #66 Toyota of Steve Wallace. The impact of Wallace's car lifted Braun's vehicle partially off the ground. Fortunately resulting without any injuries, a 12 minute red flag to clean up the messy wreck accompanied this 3rd race caution. In spite being involved in the caution, Scott Wimmer survived better than the other three cars actually leading the Bristol race for several laps following this particular caution. Wimmer brought the #7 Chevrolet to the race's finish 10th on the day. With regular NASCAR Sprint Cup competitors Kyle Busch, Joey Logano and Brad Keselowski double-dipping, Kasey Kahne driving the #38 Toyota also held the lead of the NASCAR Nationwide support race. Leading 22 laps by the midway point in the event, Kahne appeared to be a contender for the race victory until a lap 187 multi-car crash knocked the #38 Toyota out of the running. With Justin Allgaier holding off an aggressive but clean challenge from Brad Keselowski through the final laps, another more physical fight came for 5th place spot as the #33 Chevrolet of Kevin Harvick motored through Joey Logano's Toyota sending the Joe Gibb Racing car around in the final corner. Following the completion of the Scotts Turf Builder 300, Carl Edwards continues to hold off Brad Keselowski in the 2010 NASCAR Nationwide Series drivers points. However, thanks to the second place finish. Keselowski closed nearly half the point difference to Edwards standing only 26 markers back. Justin Allgaier Bristol win not only vaulted him to 3rd in 2010 points but places the driver only 5 points behind Edwards. Brian Scott's car was sliding down the track when Colin Braun's right front clipped him. Approaching a turn at Bristol you are already on the brakes and turning left about as hard as you can. There's no more "left" left at that point, so Braun was stuck. Steven Wallace, on the other hand, had nearly two extra seconds to react and piled into Braun with enough force to destroy both their cars. Just plain stupid driving! That's two NNS races in a row where Rusty's boy took out Colin Braun. At Vegas Braun wasn't lifting or slowing when Wallace clipped him going into the corner, ending Braun's top ten run. Is Steven trying to prove that the rookie has to earn his stripes by dishing out ALL the lessons? Just because it took Steven 3 years to start seeing successful runs doesn't mean its a requirement for Braun. Braun paid his dues in the NCWS with Hornaday and Bush knocking him around. Why don't we try letting Colin run a race with all four wheels and fenders and see how good he can drive?